I used the colors from this week's Color Challenge (#472 - Night of Navy, Old Olive, Bermuda Bay) to CASE (copy and share everything) this beautiful card, along with creating a tag card which Kathleen does often - so it is a combination of two or three of her cards. I'm also entering this into the latest challenge at Addicted to Stamps & More (#89 - CAS). Gorgeous, sunny day here and hoping to head out for a walk around the neighborhood soon. Need to enjoy the sun as rain is forecasted to be back with us by Friday. Hope you're all having a wonderful week. Loll, this is a beautiful card for a very special person and I'm sure Kathleen will love and appreciate it. I have one to send but had no time to play with the teapotters today. Love your splatters. It has been 80 degrees or more here today so hubby took off work and we worked in the yard today. I love being outside. We have gotten a lot done and much more to go. Hope we have a good weekend. Loll, I love that you followed Kathleen's style for her card! That water colored tag is simply gorgeous and I love the splatters in the background! A beautiful show of support! Oh Wow this is so beautiful Loll. I love the dots in the bg. What an amazing tag on your card. This is so lovely. Those splatters look fabulous! Great tag card Loll, lovely colours and really like your splattered background. Well done for stepping outside your comfort zone! A definite eye catching card and I'm sure that Kathleen will love it. Hope all goes well for her. I think it's lovely and the splashes are perfect. The colors are quite beautiful. Ooh, splatter and more splatter - be still my heart! Love it! 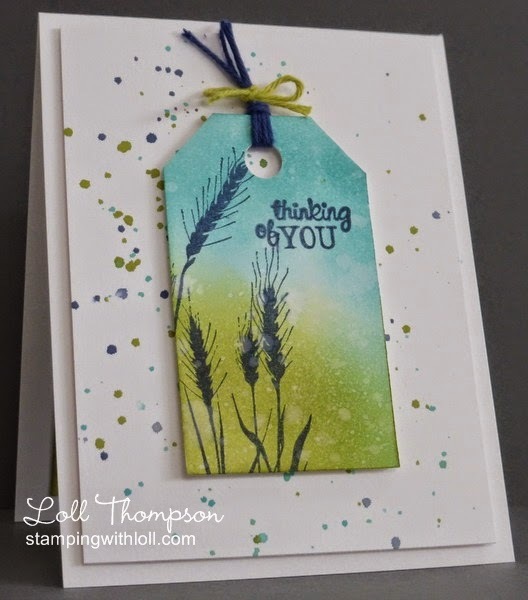 This is such a lovely tag with the sponged colors and the simplicity of the wheat! I love how your splotches match the colors of the tag! OMGosh Wow Loll! I LOVE the splattered background. I know it doesn't probably feel as clean to you without the completely open white space - but there is still plenty of white with fabulous decoration :o) Thanks so much for sharing your awesome card with us this week at ATS&M.